Each year as Memorial Day approaches, I cannot help but think about how truly blessed I am. As a former military wife, I know that fear of saying goodbye to my husband and knowing there is that chance that he may not make it home. I know the worry that is felt when the phone is silent. Where is he? What is he doing? Is he okay? I've gotten phone calls telling me that they had been blown up, but that he was okay... don't worry! I know the pride of being a military wife, and I know the fear. But I also know the joy of a homecoming... a reality that all too many wives and families will never experience. As Memorial Day approaches, let's remember that this is not just a day to show your American spirit or grill out with your family, it is a day to honor those who have given the ultimate sacrifice and to lift up their families in prayer. 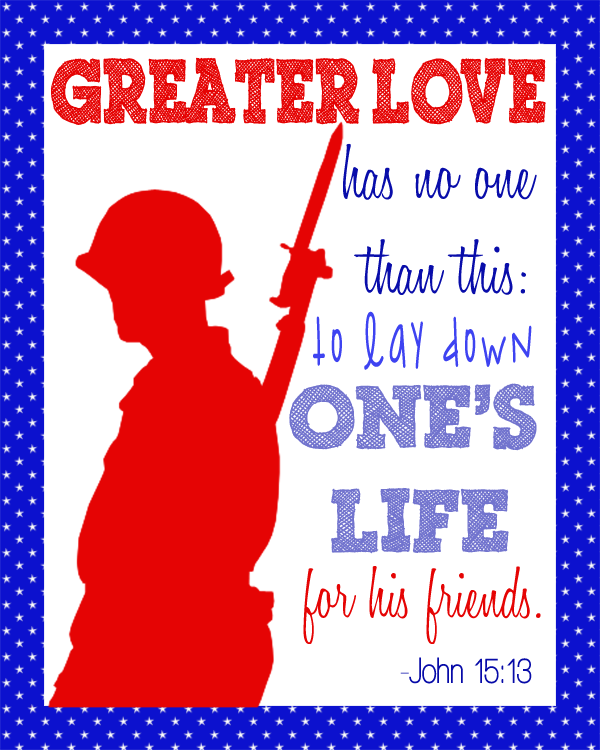 To honor those service members, I have created this pinnable/printable image for you to share and download featuring a verse that I feel is absolutely perfect for our military. You can download and print your free printable here. Oh thank you so much!! I will print this and place in in my patio window so anyone who pulls into our parking can see!! I am so thankful to our troops!! This is a great printable! Thank you for sharing! This is so neat and what a great verse too!